Let me start by showing you the “official response” to this from Palin. What is unfortunate for Sarah is the fact that she thought this photo shoot was something that is…OK…for an American candidate, especially in light of the the “VALIDITY FACTOR” that is in play these days. She told Barbara Walters that the photo on the cover was “a wee bit degrading.” OMG! SHE POSED FOR THE PICTURE BEFORE IT WAS PRINTED! Maybe her realization that that photo is a bad idea coming too late is an indication of her decision making skills?????? WAIT, put your pitch forks away….let me explain further. Is it wrong for a male/female political figure to pose for Runners World in 8″ shorts. NO. Does it increase her visibility in the country? YES. Is it looked on favorably by the country in terms of what we expect our politicians to be? NO. Is that my fault. NO. Well, maybe. 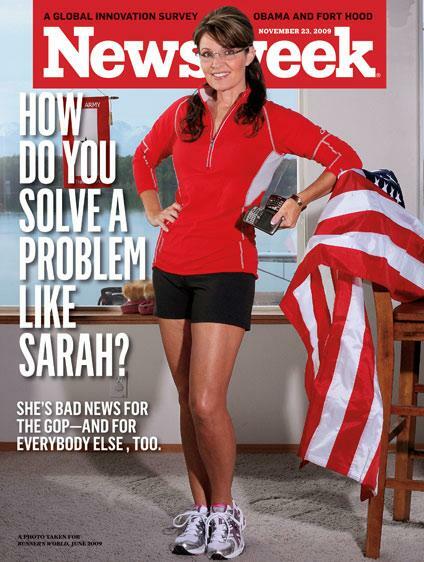 Maybe it is all our faults that Sarah Palin thinks that Runner’s World photo shoots, in attire that wouldn’t meet the dress code in her own fund raisers, is what she needs to do to really gain market share and appeal to all the “Joe Six-Packs” and “Hockey Moms” out there. AARP: The Magizine has roughly 24 million (UNREAL) copies going out every month. Whereas Runner’s World has approximately 650k copies (ITS NO AARP) every month in distribution. Lets be honest you need to appeal to your base and they read AARP not Runner’s World.